Bobwhite numbers appear to be healthier this year in many parts of Oklahoma, according to field reports from quail hunters. The state's quail hunting season is under way and will run through Feb. 15. After several years of disappointment in the field for quail hunters, the 2014 season is proving to be one to remember. Several hunters have reported that quail populations seem to be improved, and they are having success finding and harvesting bobwhites and scaled quail in some sections of Oklahoma. 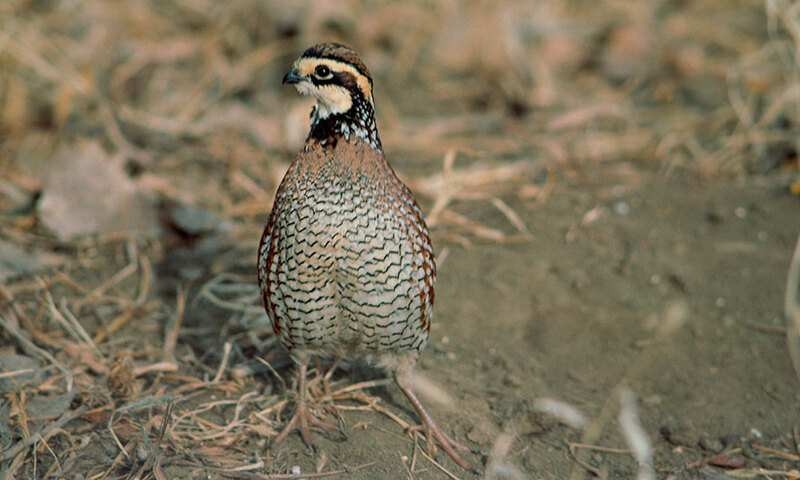 Random surveys of quail hunters indicated they were finding several coveys of quail in the Panhandle, northwest and west-central parts of the state. In the Panhandle and northwest areas, hunters reported moving an average of four coveys per day, with each covey containing an average of 13.5 birds. Hunters in the west-central region reported moving an average of 3.6 coveys per day, with each covey containing an average of 13.5 birds. In the southwest region, hunters said they moved an average of two coveys per day, with an average of 11.8 birds per covey. Gordon Thomas: "Quail numbers are better they have been in a long time. Now we just need a little more moisture for the dogs to work." Bobby Bell: "In the places I've been, I have seen five to 10 times the number of birds that we've had in previous years. I've seen eight to 10 coveys in areas where there was just one last year. Covey sizes are really good compared to last year, and there are plenty of young birds. It looks like they hatched out right up into September." Joe Neal Hampton: "I've been half a dozen times this year, and it is definitely better than the last two years. In a spot that last year we were moving one to two coveys, we are moving six to eight coveys this year. Covey sizes are a little bigger, and it looks like we had a late hatch this fall." Biologists and technicians with the Oklahoma Department of Wildlife Conservation also expressed optimism based on their observations in the western sections of Oklahoma after the opening weekend. "Weather dictates 'boom' or 'bust' reproductive summers, and also dictates how well hunters will do during the hunting season," said Scott Cox, upland game biologist with the Wildlife Department. "Quail thrive and have higher nesting success in wet and cool summers versus hot and dry summers. In wet and cool conditions, the production of insects is favorable along with nesting grasses and forbs. "The much needed-rainfall helps in producing forbs with higher seed content and better insect numbers. Also, rainfall in the summer months makes such shrubs as sand plum, sumac, shinnery oak and wild rose healthier, to provide escape, thermal and loafing cover for birds during all seasons of the year. "All these factors put together with the timely rains give us a boost in reproduction," Cox said. Francis, of Quail Forever, said he went quail hunting in Ellis County a week into the season, and he moved about 10 coveys each day. And those coveys were large, he said, with 20 or 30 birds in each. And while he didn't manage to bag a daily limit of 10 birds, several people in his hunting party did get their limits. Francis said the quail numbers haven't been as good as they are now since about 2005. "It looks like a real comeback." James Dietsch, founding chairman of the Central Oklahoma 89er Chapter of Quail Forever, agreed that quail numbers are much better this year, which shows how resilient the birds can be when they get favorable weather conditions in back-to-back years. "I think the population is in pretty good shape," he said, but dry conditions remain in many parts of western and southwestern Oklahoma. Dietsch expressed concern that if the drought continues the next few years, the state's quail populations will again fall off. "This year is a far cry from what we used to have," he said. "Coveys are all a decent size," having 15 or more birds in each covey this year compared to an average of six birds several years ago. On a recent hunting trip in northwestern Oklahoma, he managed to move 11 coveys, several of them being scaled quail. But the scenting conditions for the hunting dogs were difficult, he said, so finding the singles had been tough to do. Hunters should find some success after some scouting, talking to the local folks and finding the habitat areas that are holding the birds. But bird hunters might have to work harder to find as much success in southwestern Oklahoma. Dietsch said one hunter who went to Sandy Sanders Wildlife Management Area on opening day failed to see any quail. Senior biologist Ron Smith, manager of Sandy Sanders and Altus-Lugert WMAs for the Wildlife Department, said quail hunting success in the southwestern region has been highly variable. He's heard of some hunters moving about a half-dozen coveys a day, while others have reported little success. "Overall, there are birds, and it has improved over the last three or four years," Smith said. However, hunting activity has been lower than he expected. Smith said he fielded quite a few phone calls from hunters interested in quail season in late October and early November, but he has not seen very many hunters on either WMA. Smith said the drought is still affecting southwestern Oklahoma, and any continued precipitation would greatly benefit the region. Quail hunting season will be open until Feb. 15, 2015, but seasons on public lands may vary from statewide seasons. Residents and nonresidents are required to have an appropriate hunting license, and hunters must wear daylight fluorescent orange clothing when required. For details, consult the "Oklahoma Hunting" guide online at wildlifedepartment.com or in print where hunting and fishing licenses are sold.